PulsePoint cardiac arrest survivor Sean McGuire vows to learn CPR so he can carry the app that helped save his life. Here is a listing of Peoria's various Night Out Against Crime activities for Tuesday, Aug. 1. We very much appreciate our little friends from Neighborhood House Association coming in for a visit! 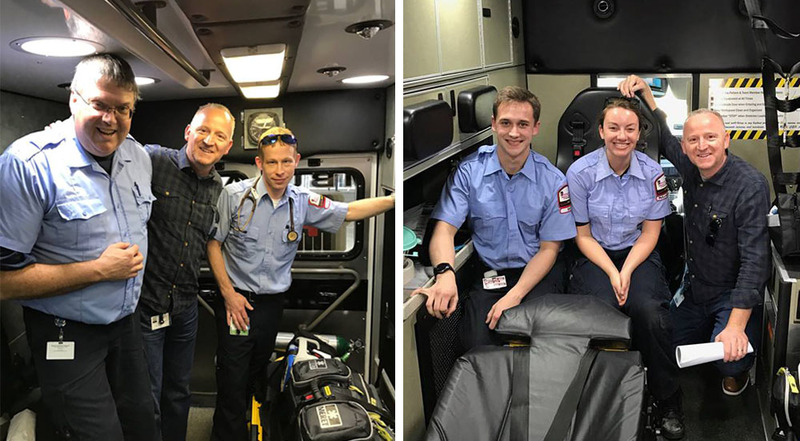 Nick Riordan has dedicated his life to serving others, and has been involved in EMS locally in many capacities for many years. You can offer a hand and follow him via this page. We enjoyed connecting with children in the Quad Cities yesterday. It's a big weekend for us - we have the John Deere Classic, as well as the Peoria Heights Fire Department 100th anniversary. Photos courtesy of Jeremy Sellers, Cary Ann, and Justin Ploog. 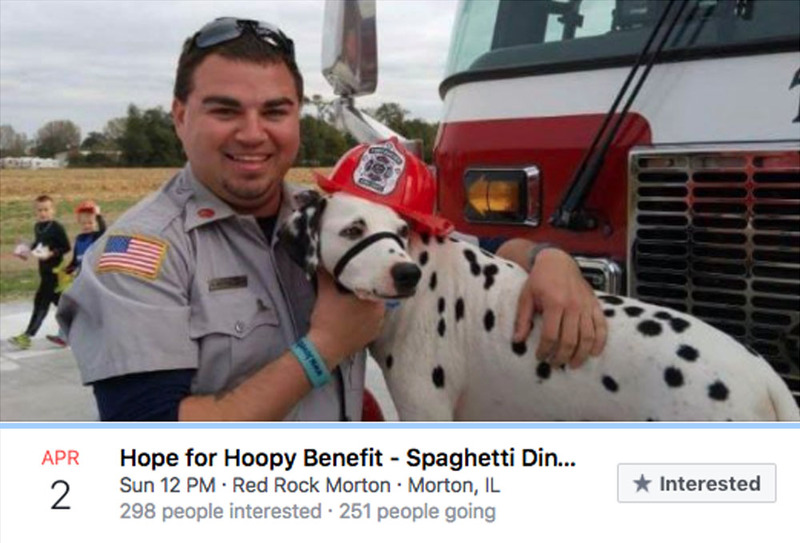 Please join us in helping our friends celebrate this proud occasion! Photos courtesy of Chris Rogers. There is still time to stop out - and we'll even teach you Hands-Only CPR! Come on out and meet us at the Peoria County Emergency Expo! Our Iowa city staff enjoyed a baseball game between the Cedar Rapids Kernels vs. the Peoria Chiefs. Photo courtesy of Carson Smith. We had a wonderful Independence Day, and hope you did, too. Fireworks photos courtesy of Garrett Wisher. Big thanks to our bike teams and staff that provided EMS coverage and support for the Red, White, and Boom event at the Peoria riverfront. A pat on the back goes to Carson and Derek for providing a motorist assist at a busy intersection in Iowa. Photo courtesy of Derek Troutwine. Team AMT sends their support and best wishes to the Riordans - dedicated helpers with hearts to serve others, who could also use a hand. Blue and white - and a little red! Photo courtesy of Garrett Wisher. 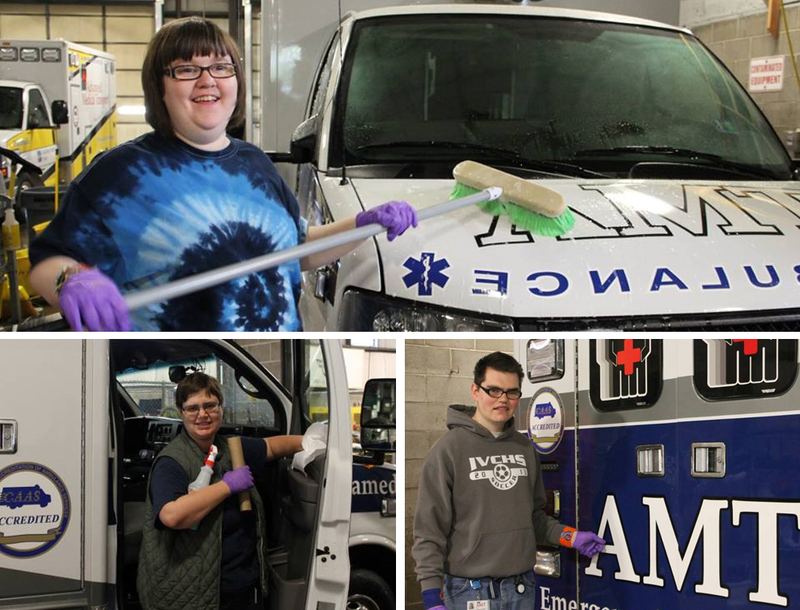 We may have found some future AMT Paramedics at the First Responders: Community Heroes class at Bradley University. Photos courtesy of Julie Schimmelpfennig. This little one made friends with the RiverMedic1 team and felt extra cool modeling her blue AMT shades out on the river. Thanks to WCBU, Peoria Public Radio for promoting workplace CPR training and AED use! Our new home in Pekin is coming right along. It will help us serve the city better than ever before, from the heart of Pekin. The Kiwanis Bike Safety Rodeo was a perfect kickoff to a safe summer in Pekin! Learn the two simple steps! Kelly Walsh joined Gina on Tuesday, to preview National CPR Awareness Week, and CPR Saves Lives Night at the Peoria Chiefs. Join us this Thursday, June 1st at CPR Saves Lives Night with the Peoria Chiefs! Help us start off National CPR and AED Awareness week with a bang! 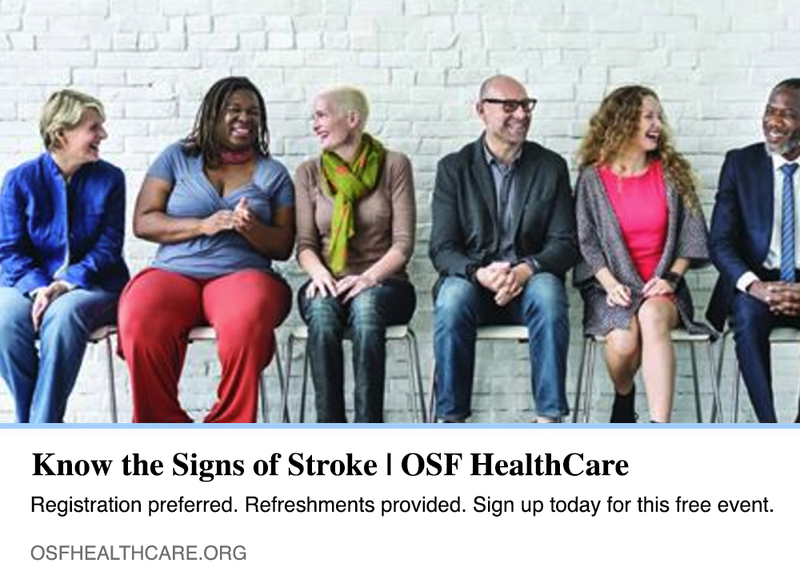 We are honored to be a part of this Community Education event on stroke care hosted by the Illinois Neurological Institute. The Illinois River is still full of large debris and has swift currents. Please be careful this holiday weekend! The RiverMedic1 team has been hard at work to help keep you safe this boating season. 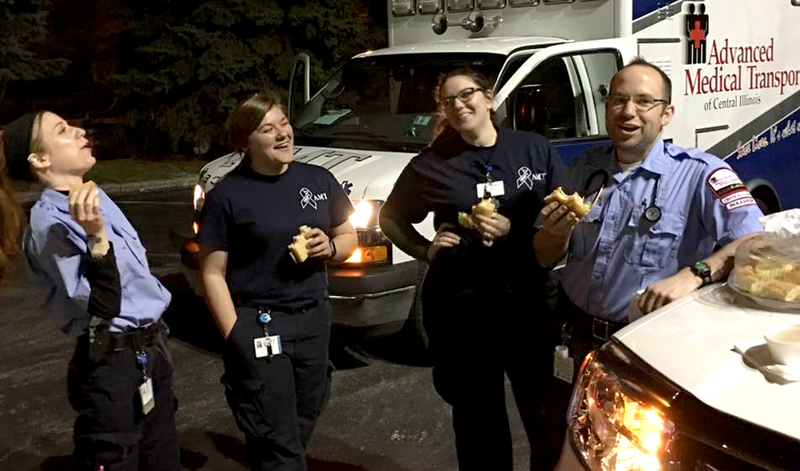 EMS Week continues in Peoria and Streator with lots of food and many more smiles. Photos courtesy of Andrew Rand and Amy Roberts. 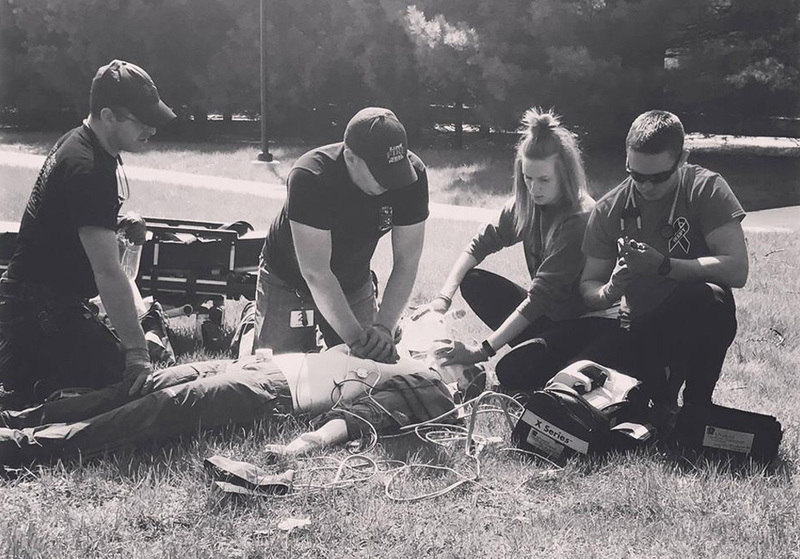 Come enjoy the Peoria Chiefs and learn life-saving skills with Advanced Medical Transport, Illinois Heart Rescue, and the American Heart Association - Illinois! We are very excited to partner up with these great community agencies for a great day of bicycle safety! 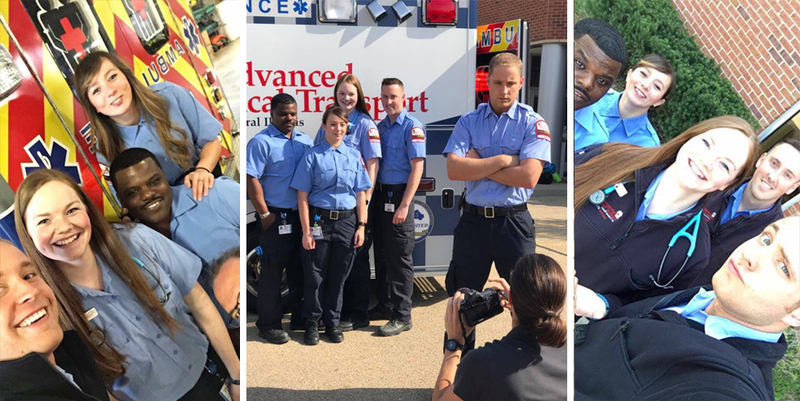 Happy #EMSWeek to all of #TeamAMT and to those we work along side out on the calls, each and every day. You are much appreciated - not only this week, but every week. Our third stop today was at the Carver Community Center's Parents' Chat and Chew, teaching Hands Only CPR. 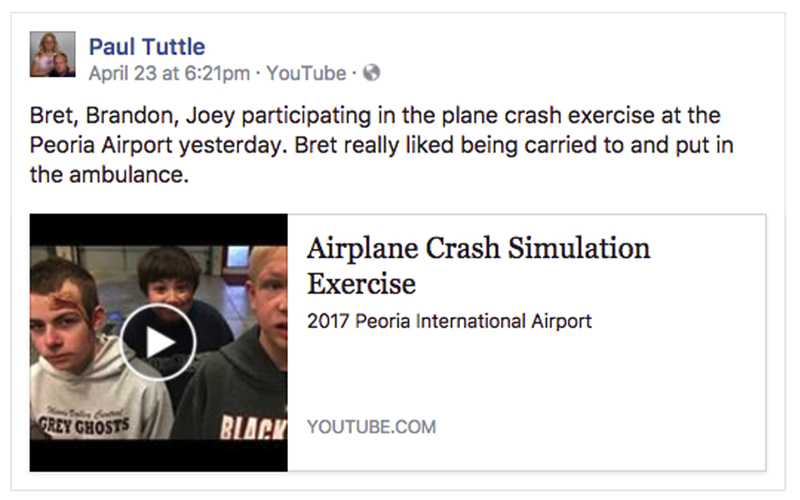 We thank them for the opportunity! The 8th Grade Health Expo is underway. We hope to meet some of our future clinicians and caregivers today! We are always awed by the sight of the Susan G. Komen Race for the Cure. What are some of your favorite moments from the weekend? Photo courtesy of Evan Long. We are honored to be a part of this great event. 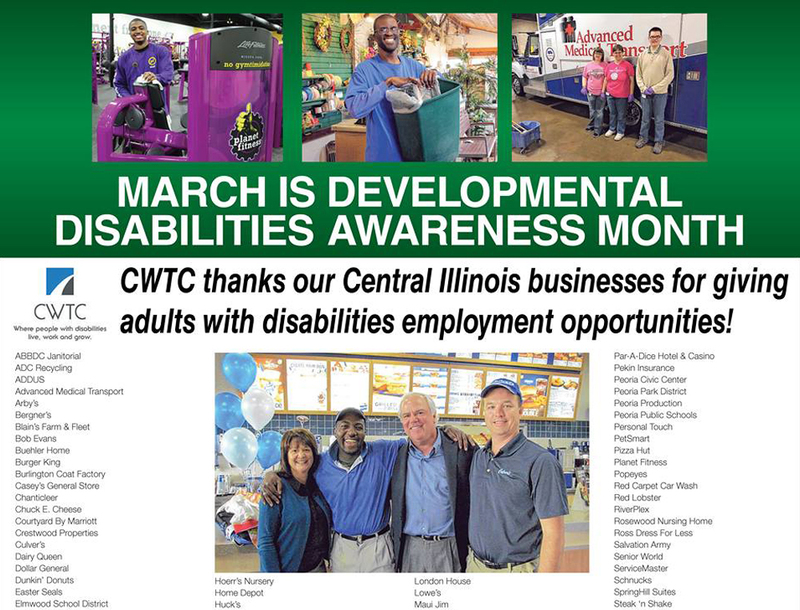 Did you happen to spot our smiling CWTC #TeamAMT STARS in this recent print advertisement? Calling all Quad Cities area Paramedics! Make a difference in the community in which you live and join our fast paced team of experienced care givers. AMT is now hiring full and part time positions. Must be National Registry Licensed. A big shout out to Jennifer Fleming! Tomorrow morning she begins her new role as Director of Operations, AMT East. 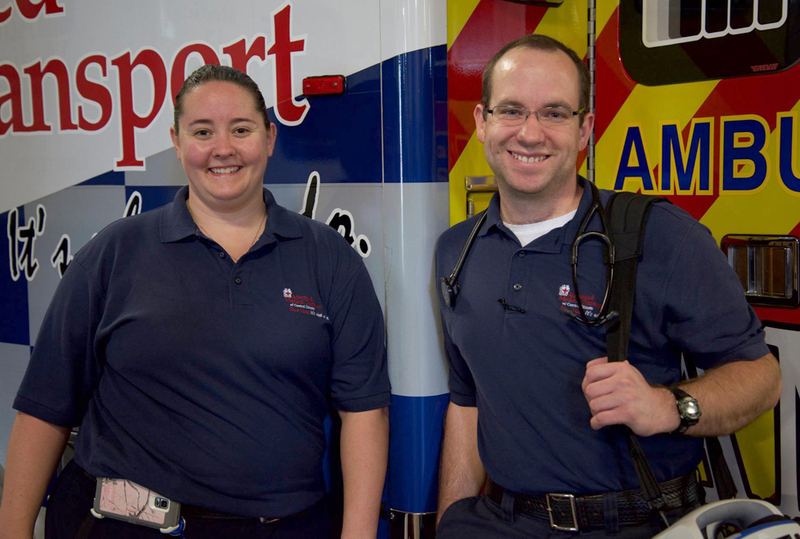 Jennifer began her career with AMT in 1992 as an EMT Basic. She has worked her way to Paramedic, Critical Care Paramedic and Pre Hospital Registered Nurse. Jennifer helped start the Streator, Illinois office and has been a supervisor for several years in the Pekin and Peoria markets. Congratulations on your new role! 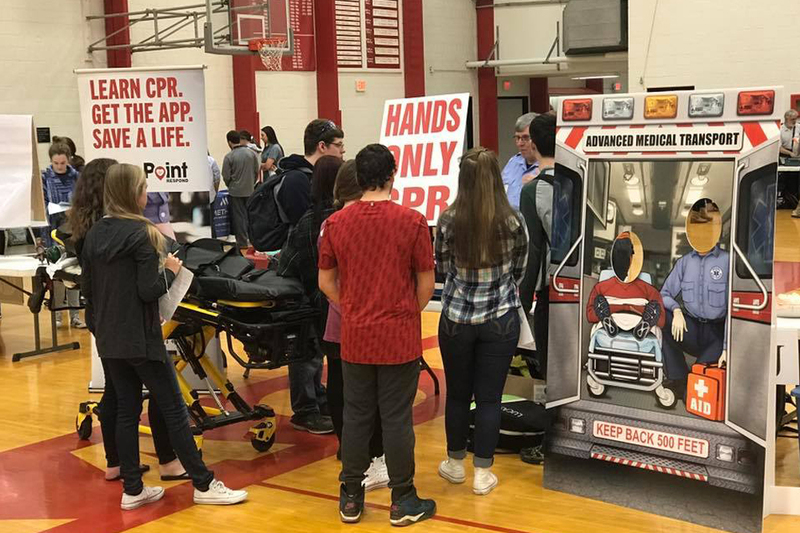 We always greatly enjoy talking about EMS at Pekin Community High School Wellness Day! 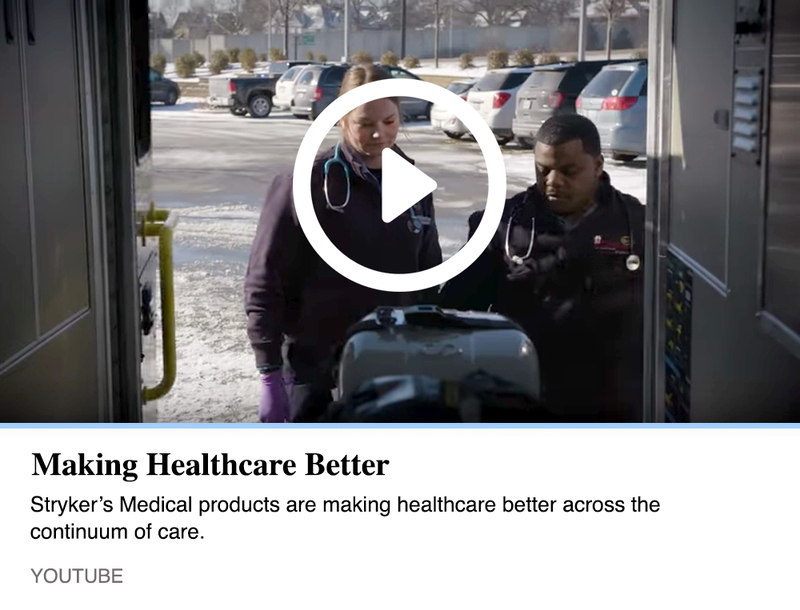 One of our #TeamAMT stars made this video to go along with her paramedic class project. 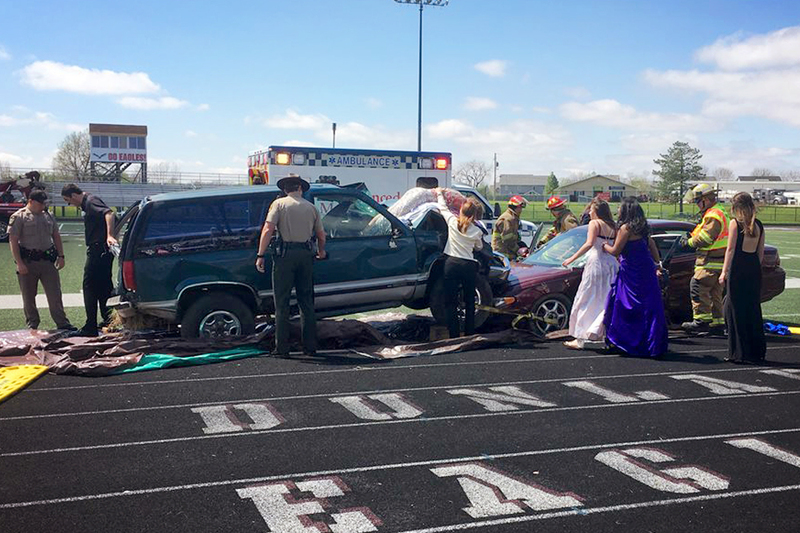 Thanks to Dunlap High School for inviting us out to help remind students to be safe and responsible on prom night. Photos courtesy of Elizabeth Schindler. Saturday, AMT participated in a training exercise at Peoria Internarional Airport. It gave us a chance to interface with some of our great partner agencies in a mock disaster. 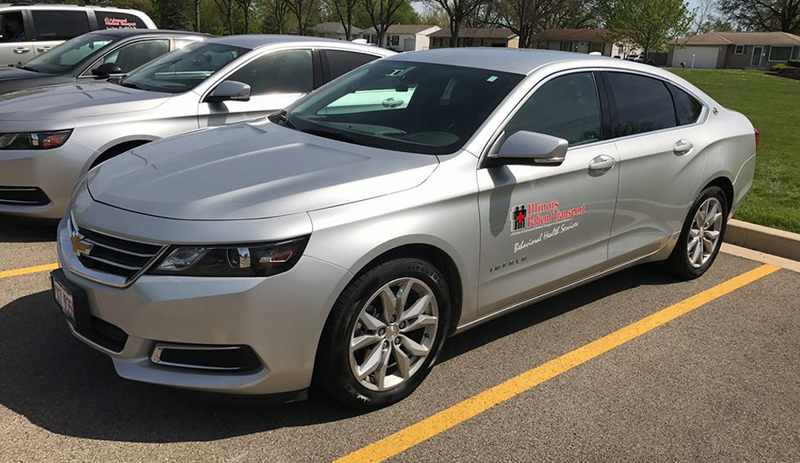 We are looking for Transport Technician drivers who are responsible for the compassionate, safe, and efficient movement of behavioral health clients between healthcare facilities for our Illinois Patient Transport division. These full and part-time positions are open in Peoria, Streator, and Marion. Needed are people who are available weekends and nights, like to drive, and are good with people. Excellent benefits and training provided. For more information, visit amtci.candidatecare.jobs. 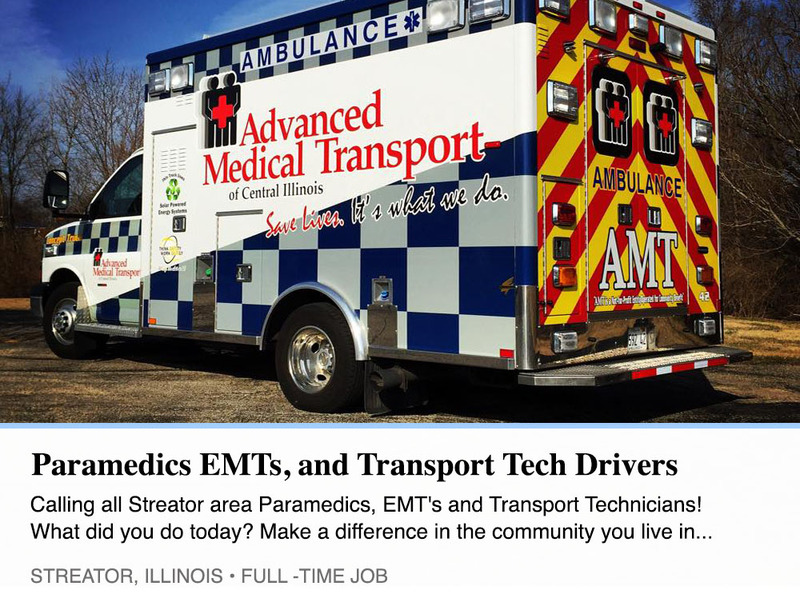 Calling All Streator Area Paramedics, EMT's and Transport Technicians! Make a difference in the community you live in and join our fast paced team of experienced care givers. AMT is now hiring full and part time positions. Must be licensed in the State of IL (EMT's and Paramedics). This morning, when a person needed immediate help, over a dozen nearby CPR-trained people were notified via their smartphones. Also, the nearest AED devices were instantly identified. There have been two PulsePoint incidents already today. 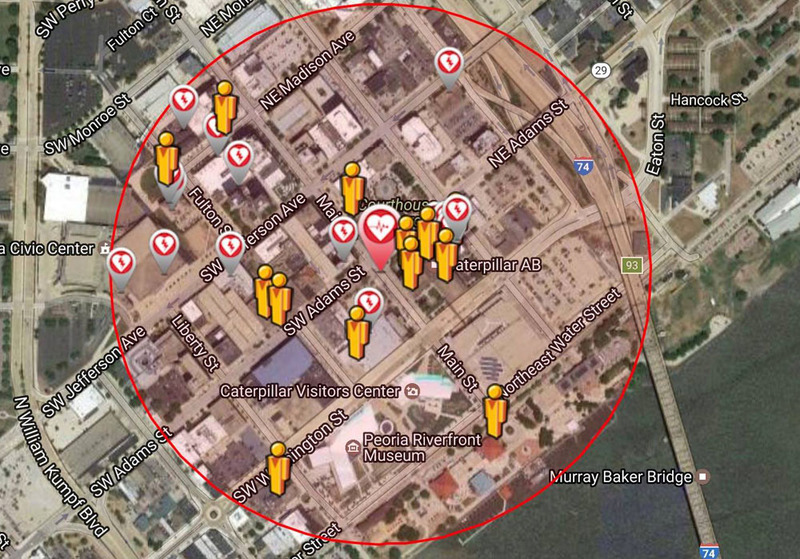 Do you have a story to tell as a AMT PulsePoint Citizen Superhero? If you are among the 1,400 users, and hundreds of responders, we'd love to hear from you. Please message us! 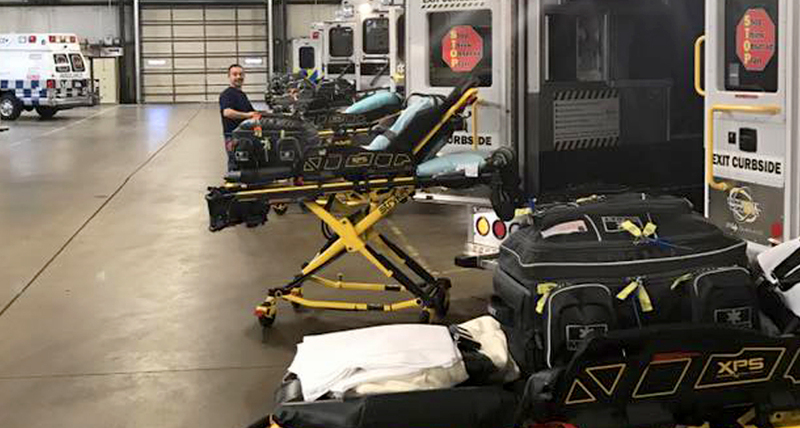 Our future Paramedics in the Advanced Medical Transport EMS Academy rehearse hundreds of possible patient care scenarios during their 1,500 or so hours of training. Photo courtesy of Amanda Gaylord. 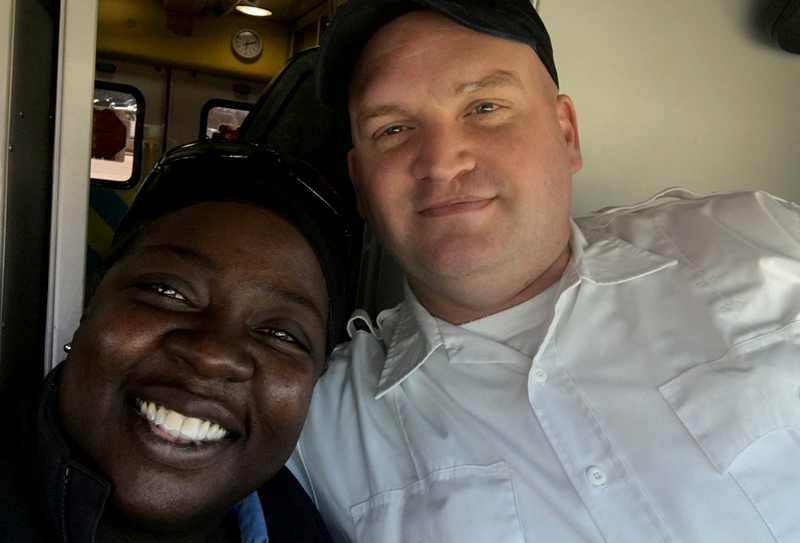 Medics all over the world are posting pictures with their EMS partner. The project is an effort started by Ginger Locke from the Medic Mindset podcast. She's working to make a collage to send to FDNY medic Monique Williams who lost her partner tragically in the LODD. Share this announcement and your pictures. Remember to tag the picture with #partnerproject and set it to "public" so they can be found." 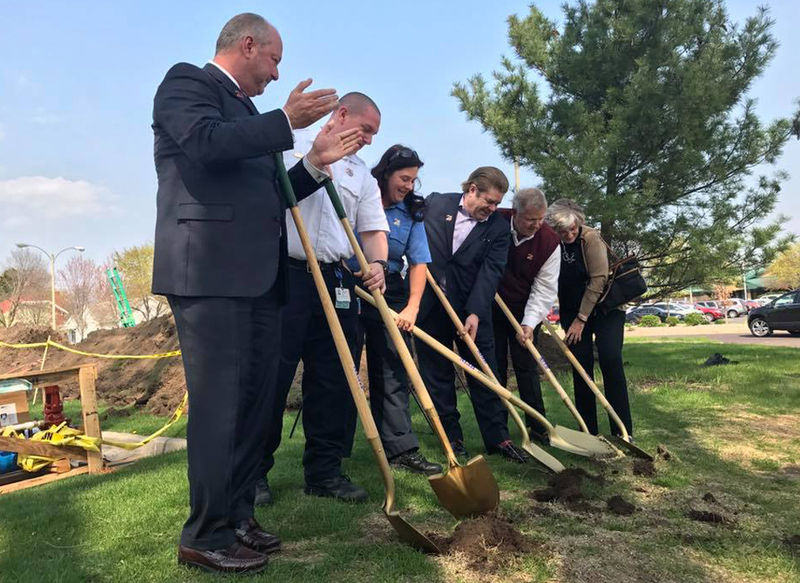 Today we broke ground on our new Pekin facility, located at the very heart of the community. 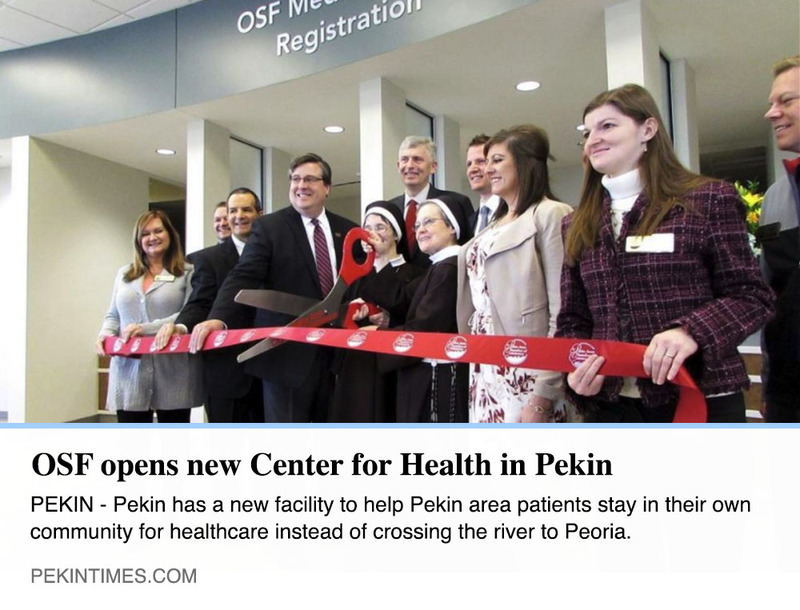 It will serve the present and future needs of our Team and our resources, and allow us to partner with UnityPoint Health - Pekin on future community healthcare initiatives. We would like to thank everyone from the city, the county, police, fire, healthcare, local business, and the Pekin Area Chamber of Commerce who showed up to support us. 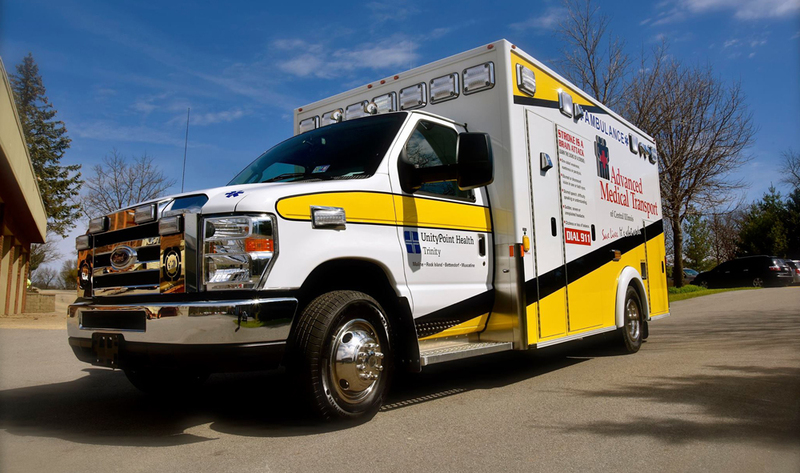 Calling all Iowa Paramedics, EMT's and Drivers! What did you do today? Make a difference in the community you live in and join our fast paced team of experienced care givers. AMT is now hiring full and part time positions. Must be licensed in the State of Iowa. Saving lives is something that anyone can learn to do, and we'll teach anyone who'll listen. Become part of AMT's everyday heroes today, and let our PulsePoint app alert you when someone near you needs CPR and an AED. Congratulations to our friends at OSF and to those who will be served with the greatest of care by this new facility. Watch for an exciting Pekin AMT development next week! 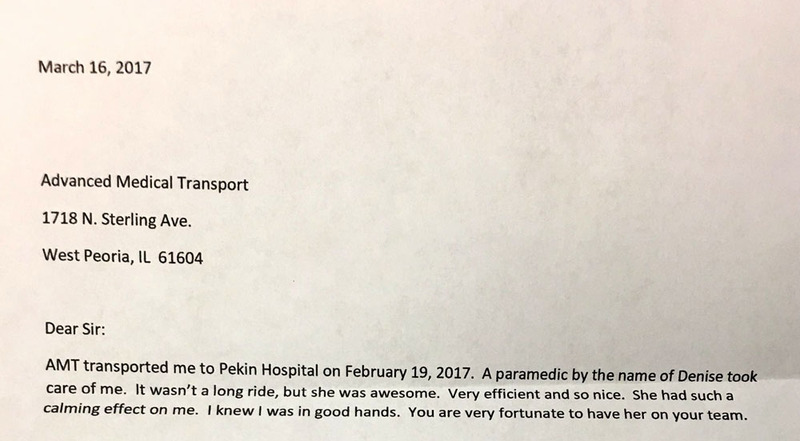 We always appreciate these kind words sent to us by our patients - this one about one of our most experienced Paramedics. Thanks, 25 News for a great story on our effort to strengthen the "safety net" of AEDs and CPR trained individuals in our area. Nothing beats having an everyday hero right then and right there! Advanced Medical Transport of Central Illinois ... supporting United Way Did you know that Advanced Medical Transport of Central Illinois partners with the Heart of Illinois United Way to support people in need throughout central Illinois? 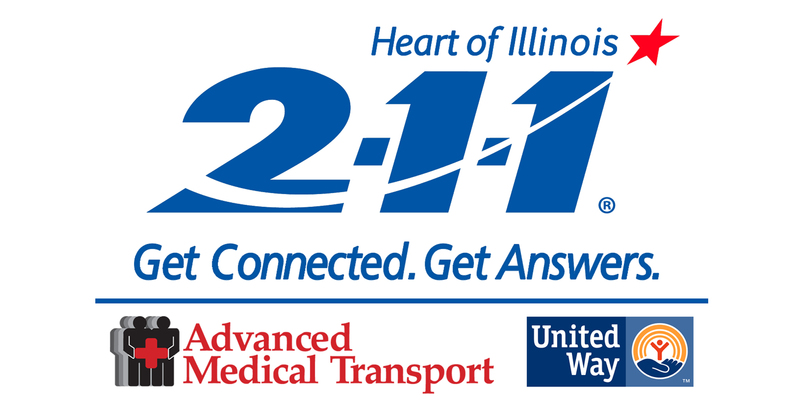 As one of our top 20 campaigns, Advanced Medical Transport (AMT) and their employees are dedicated to volunteering for the United Way, supporting our annual campaign, sponsoring our fundraisers, and most importantly fulfilling the need to provide 24/7 information and referral through the Heart of Illinois 2-1-1 service. The Heart of Illinois United Way's partnership with AMT is vital to providing continual, comprehensive information and referral services to people in need throughout central Illinois. Unfortunately, there are individuals every day who go without essential services while help is readily available. Together, the United Way and AMT are connecting callers to critical health and human care programs. Linked to AMT's 9-1-1 call center, 2-1-1 information and referral specialists can easily transfer calls in case of emergency and 9-1-1 call center staff has been cross-trained to provide 2-1-1 assistance. 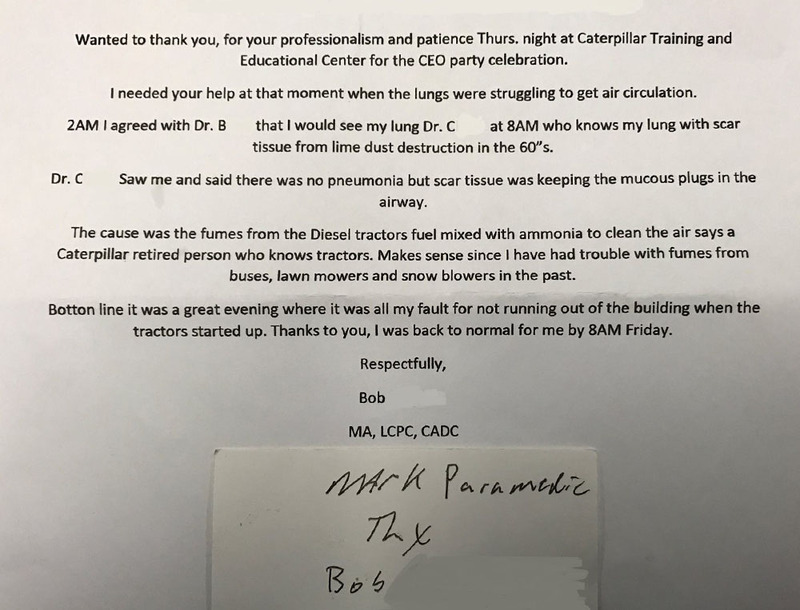 And in cases of extreme emergency, the call center at AMT is rated to withstand an F5 rated tornado, has redundant phone lines and emergency power, a self-contained HVAC system and web based software. 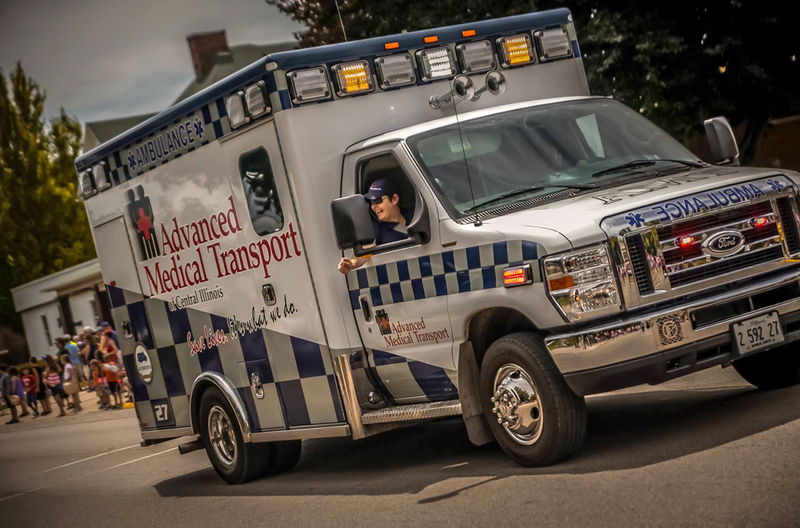 AMT serves various roles in the communities it serves, providing many types of emergency and non-emergency transportation and regional medical transportation service. 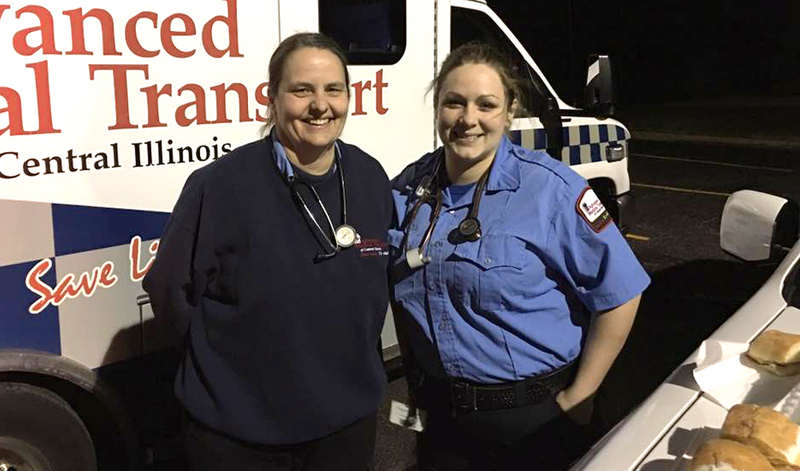 As the only Illinois ambulance provider to become nationally accredited by the Commission on Accreditation of Ambulance Services, AMT employs more than 350 full-time dedicated staff members, whose combined talents provide emergency and scheduled medical services to more than 850,000 residents. 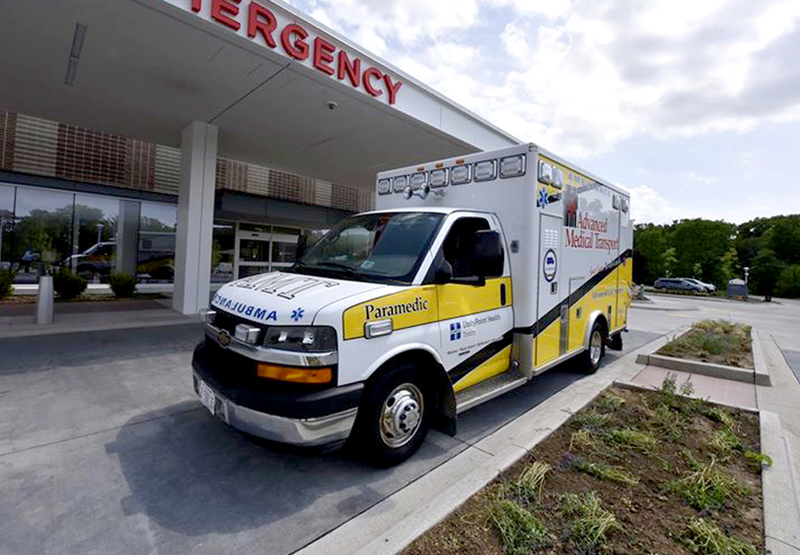 Our 48 licensed paramedic ambulances respond to more than 54,000 "911" calls and 15,000 scheduled calls annually. Last year, the Heart of Illinois 2-1-1 call center staff at AMT answered more than 8,000 calls resulting in more than 17,000 referrals for help with services related to housing, utilities, food, clothing, case management and much more. Visit 211hoi.org or amtci.org for more information. 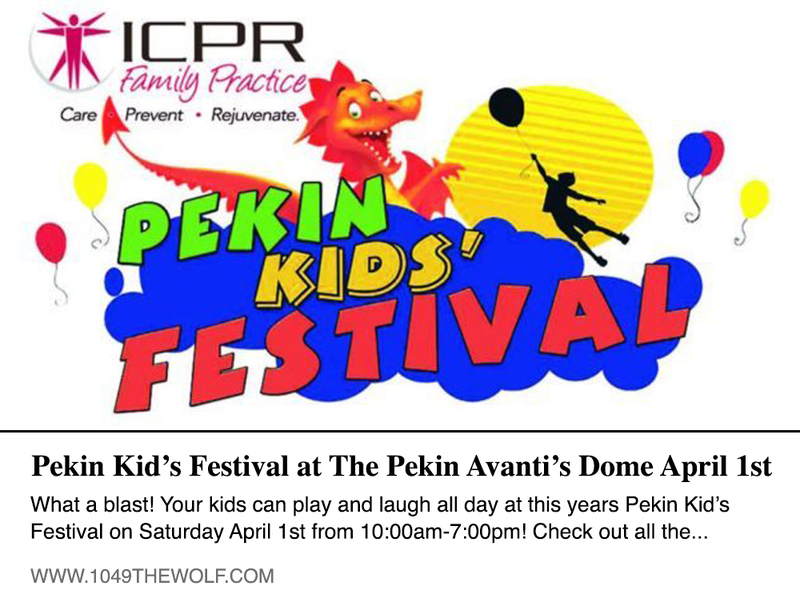 Thank you to all of the new friends we made at the Pekin Kids' Festival and Business Expo. Special thanks to the Pekin Area Chamber of Commerce! Come see our award-winning booth at the festival THIS Saturday! No fooling! 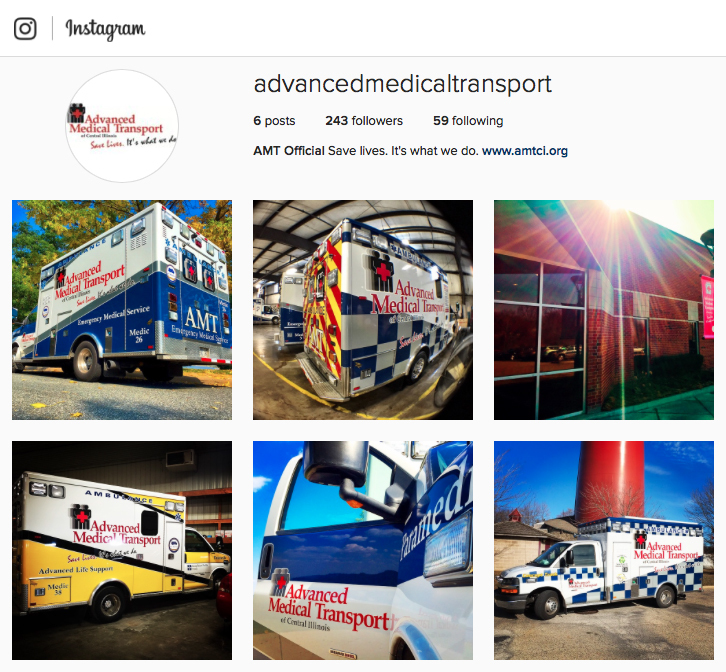 We are very proud of the compassionate healthcare provided by #TeamAMT. Congratulations, Denise! Quality Manager Jai spent the day spot checking crews for accreditation preparedness. AMT was the first agency in Illinois to exceed the stringent standards for CAAS accreditation - and with a perfect score! Yesterday AMT presented at the Tazewell County Partnership for Inclusive Employment (TCPIE) Reverse Job Fair, highlighting our continued involvement in providing specialized job opportunities for our friends at the Community Workshop & Training Center. 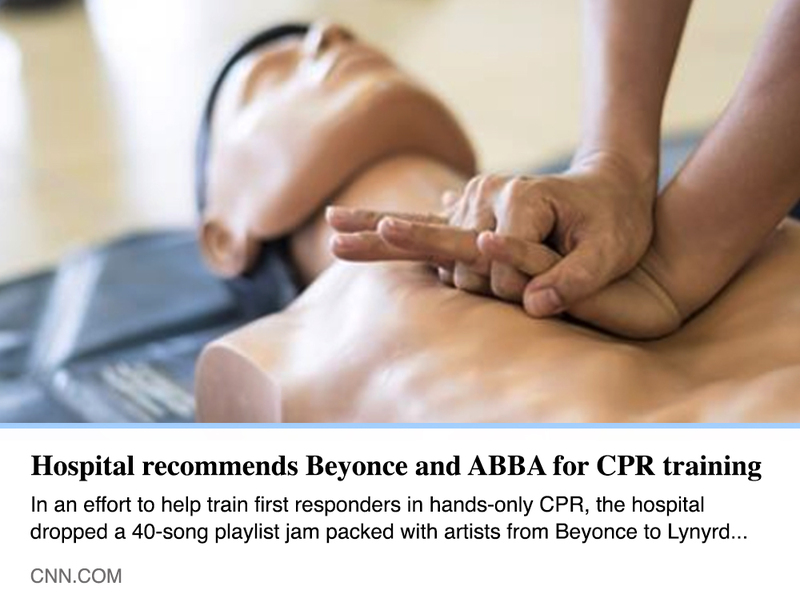 Tired of humming "Stayin' Alive" by the Bee Gees during CPR? Here are some more 100bpm songs to keep you compressing on beat. Our crews enjoyed Avanti's Gondolas between calls on St. Patrick's Day - a busy day for us. Photos courtesy of Bret Ramp. Hector Ortiz prepares the fleet for inspections this morning. TeamAMT! 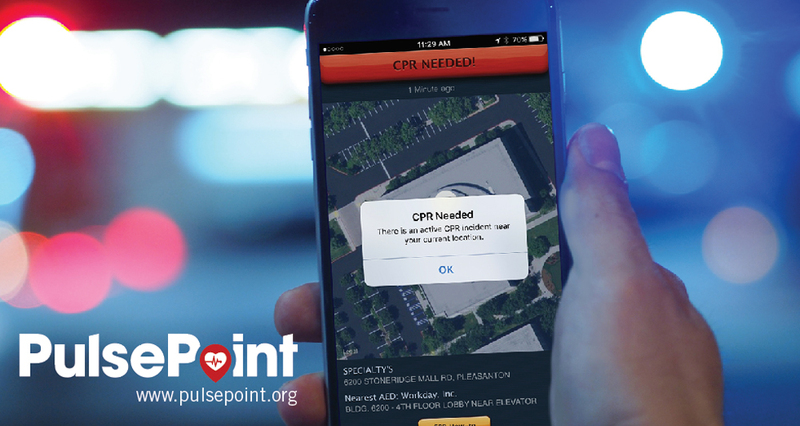 PulsePoint connected agencies just notified their 💝 50,000th 💝 nearby CPR-trained citizen/off-duty responder! Overall agencies are averaging 2.75 responders per cardiac arrest event. Although we cannot identify this responder they were in Pittsburgh, PA. This is a historic milestone. Live stats are always available at http://www.pulsepoint.org. 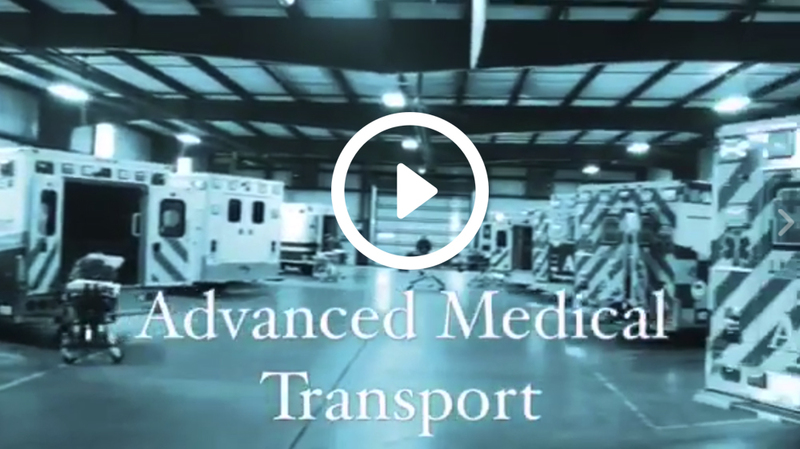 Advanced Medical Transport is proud to call Peoria #myheadquarters! Join us by visiting http://peoriaheadquarters.com to learn more. We thank One World Cafe for committing to being life savers by training their staff and placing an AED in their business. We are excited to help many more businesses do the same! We are looking forward to a great 2017 with this project! Thank you to One World Cafe for your enthusiasm and energy! 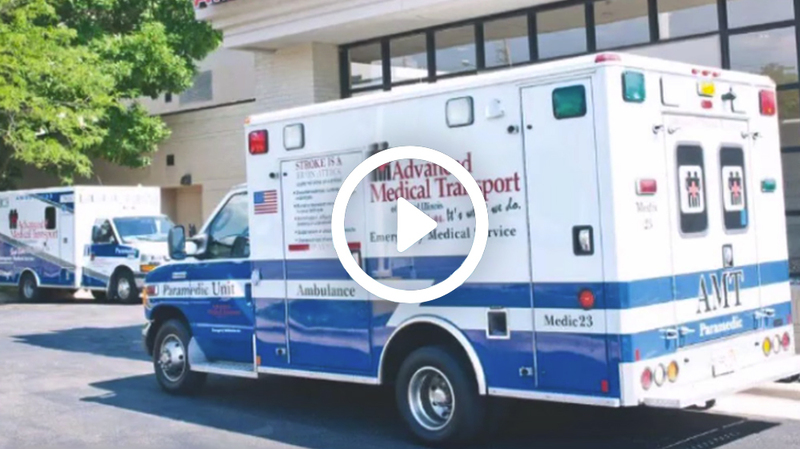 "One World is excited to be partnering with Advanced Medical Transport for CPR and Automated External Defibrillator (AED) training. Our training starts this week and we'll soon have an AED available here in the event that anyone in the area would be in need. 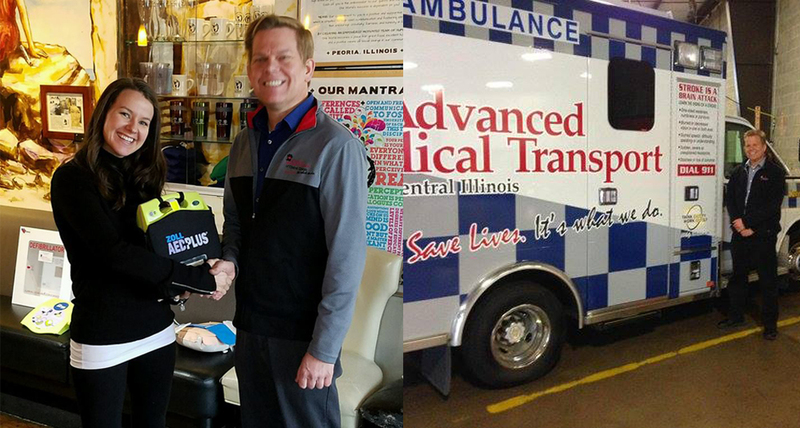 We wanted to post a HUGE thank you to Josh and Advanced Medical Transport for making this education possible! 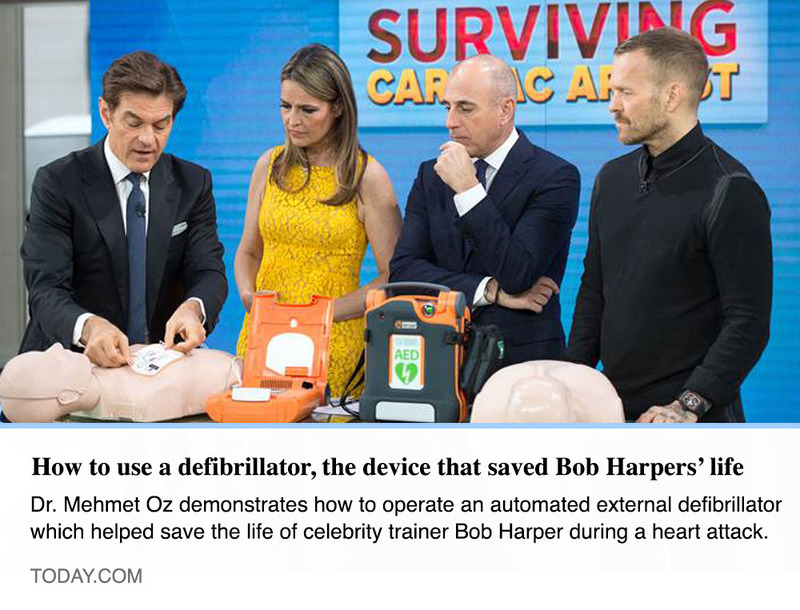 Please let us know if your business is interested in offering free CPR training or purchasing a life saving AED - we can get you connected to the right people!"